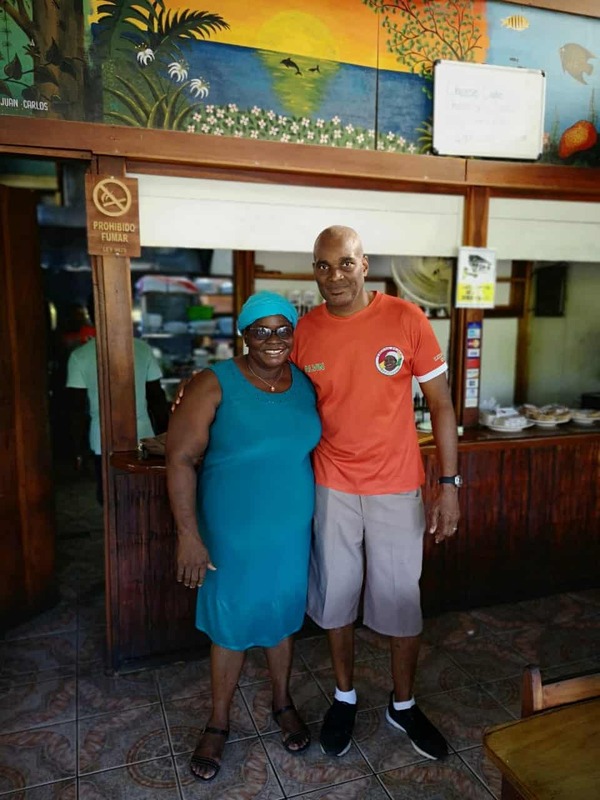 PUERTO VIEJO, Limón — While Lidia’s Place is about 12 years old, Lidia Palmer has been cooking Caribbean specialties for decades. She got her first professional kitchen experience in 1986 at Stanford, which in its time I understand was one of the best restaurants in the country for Caribbean food. Palmer quickly grew tired of working for others, though. She would bake and sell pupusas and Jurney cakes, a coconut milk-based baked Caribbean treat, from her home. 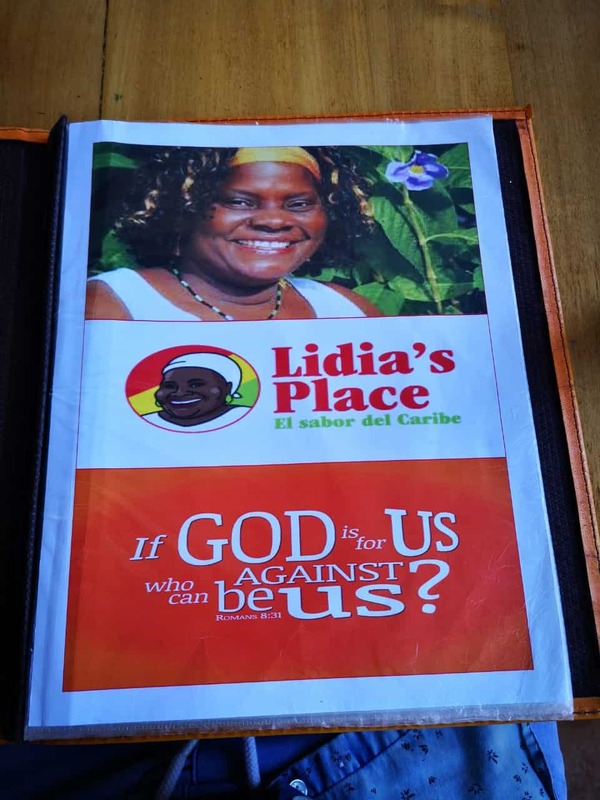 She eventually went into business on her own and opened up Lidia’s Place. As time went on, her restaurant has turned into a must-stop in Puerto Viejo. 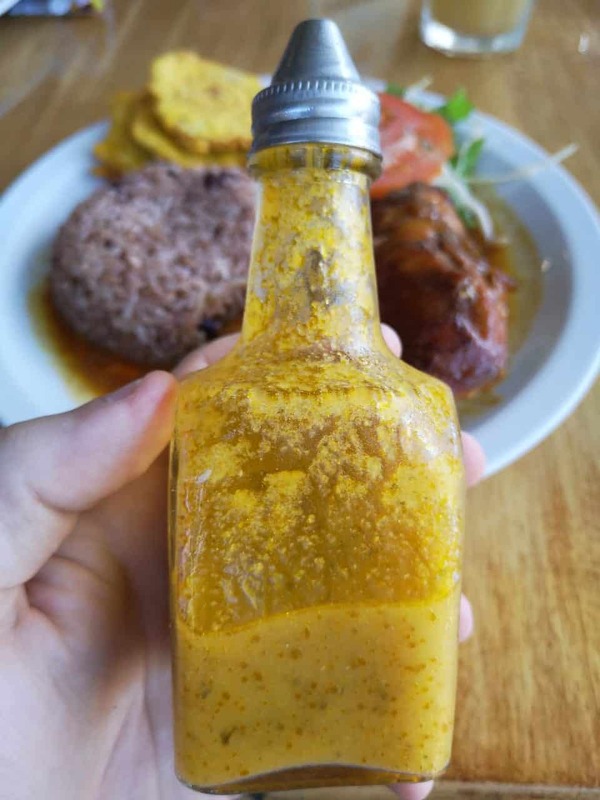 While it started as a place to sell hamburgers, which are no longer available, it’s now known for its unique and authentic Caribbean flavors. Thankfully, she didn’t stick to hamburgers, because her Caribbean food is amazing. While everything on the menu is delicious, there are three main dishes that I recommend. These are what you come to the Caribbean coast of Costa Rica to eat. For the budget-conscious traveler, this is the number one choice, coming in at just under 5,000 colones (about $8) including taxes. The portion is generous and flavors are unmatched. If this isn’t the best plate of its kind in the country, it’s certainly one of the best. Every bite I imagine to be the taste equivalent of being front row at a Bob Marley concert (RIP). It’s easy to eat. 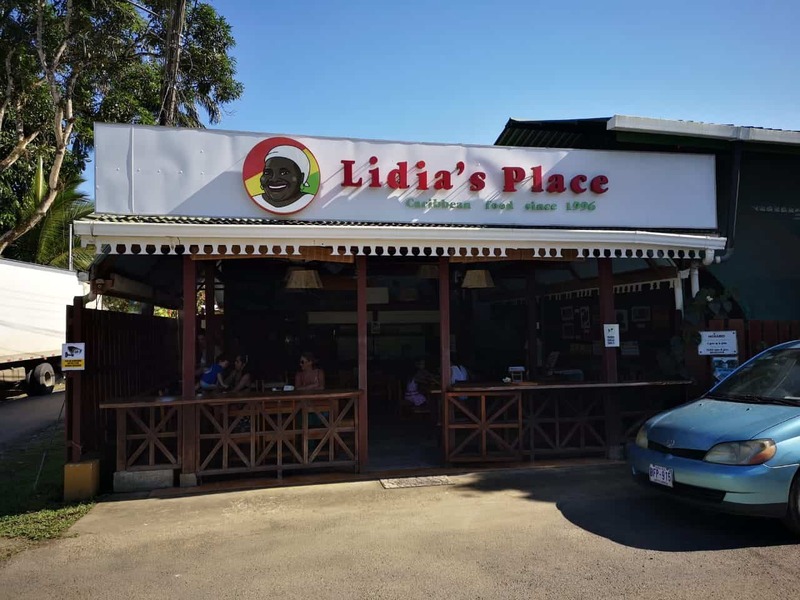 The other two stars at Lidia’s place are the Caribbean Style Lobster and Lidia’s Style Red Snapper, both of which showcase the incredibly fresh local seafood. While the lobster comes with the same sides and sauce as the chicken, it’s price much more expensive.You choose the size of the lobster, with options ranging from 300 grams up to 800 grams. Those prices range from 11,000 colones ($18) to 29,000 colones ($48). It might be pricey, but it’s worth every penny. The lobster is grilled to perfection and is exactly what the body seems to crave in this environment — at least mine does. The Red Snapper is big and served whole with a price of 12,200 colones ($20). 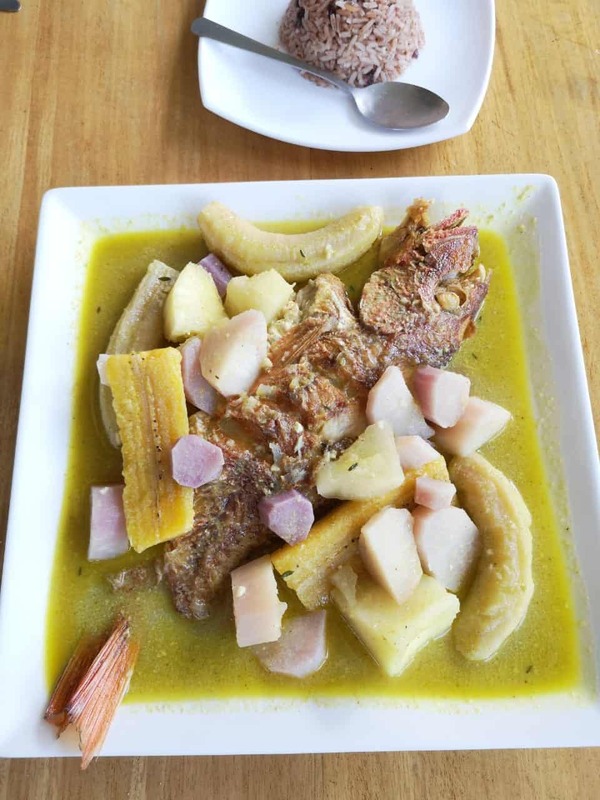 In addition to the perfectly steamed fish, which is a welcome change from the standard fried version, on the side, cooked in the same sauce as the fish, are bananas, plantains, purple yams and yucca. This medley of different starch/root vegetables works nicely to balance with the protein and all together; it is super filling — and even more satisfying. For this dish, the traditional soup known as Rondon, which is another staple in this area, inspires Lidia’s preparation. One of the main differences is that it is not served in a bowl, as a soup, but rather on a plate that would be perfect for sharing. 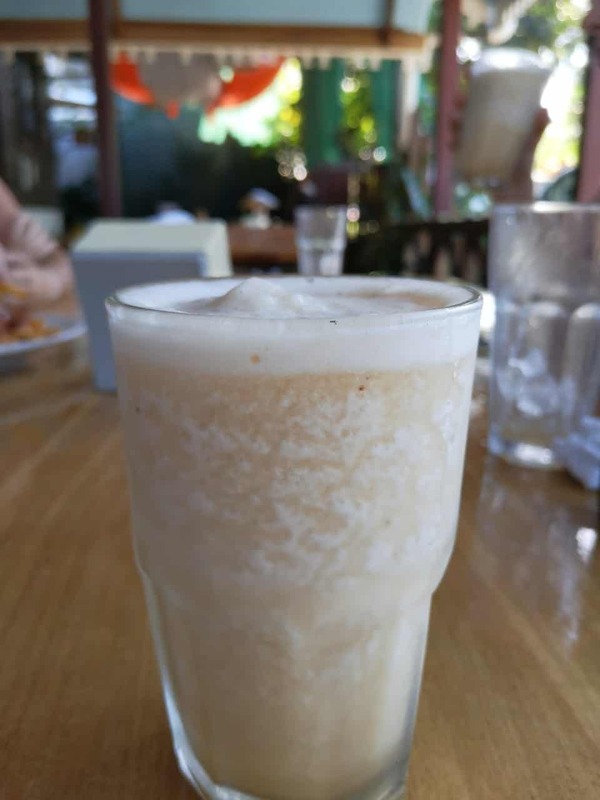 To drink, I always have a hard time choosing between Tamarind juice or Hiel; a traditional Caribbean drink known as “agua de sapo.” It’s made up of tapa dulce, fresh ginger, lime juice and water, served over ice. The tapa dulce adds sweetness and the fresh ginger adds a level of heat or spiciness, and when served cold, it’s a perfectly refreshing balance under the Puerto Viejo sun. Jackfruit was also in season during my visit. It’s known locally as monkey fruit or “fruta de mono.” I ate this fruit all over Southeast Asia and was surprised to see it growing on trees around Puerto Viejo. It was a pleasant surprise because the smoothie they make using it was absolutely delicious and one of a kind. I will plan my future trips around jackfruit season so I can keep enjoying this drink. Try one of Lidia’s famous coconut cookies or desserts to finish your meal. They have lime pie, banana splits, cheesecake and chocolate cake, which is made using locally produced cacao. All of these are priced the same, at 3,500 colones (about $5.70), and all are guaranteed to satisfy your sweet tooth. 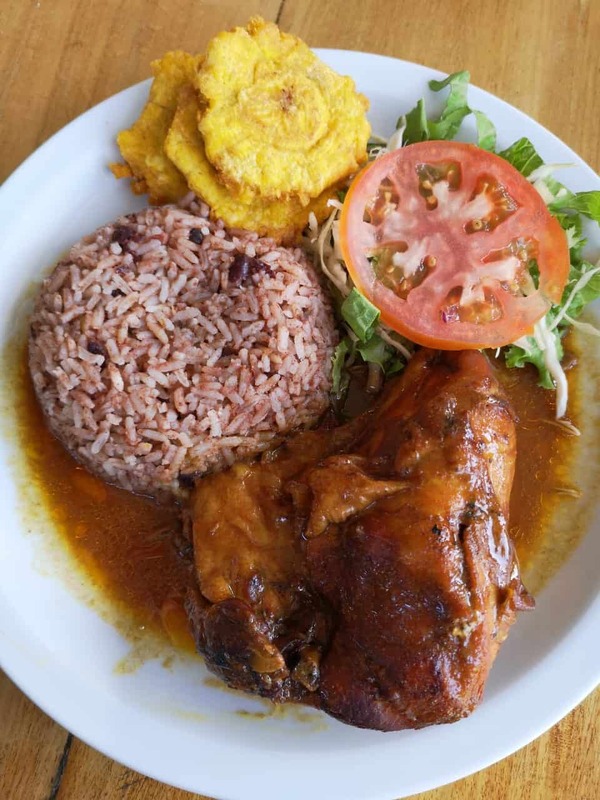 Aside from the incredible Caribbean cuisine, Lidia’s Place has really become a family business. A handful of her loved ones work at the restaurant, including her cousin Alvin, who was in charge of waiting on our table on my most recent visit. Lidia herself remains humble and is still happy to greet guests and make sure everything is to their liking. Her reputation alone is enough to keep the restaurant packed, but she’s still there; present, passionate and consistent. They constantly post photos of Lidia with different local politicians and professional football players on their Facebook page. But at Lidia’s Place, everyone is gets special treatment. Everyone is a celebrity. Her staff, which as I said is mostly made up of her relatives, is also very friendly and provides a surprisingly efficient service – which is not very common in Costa Rica and much less in a place like Puerto Viejo, where the Rasta vibes and a generous consumption of marijuana make for a slower pace of life. Located inward of Puerto Viejo town, this restaurant is not along the main beach strip and does not have an ocean view, but the setting is still nice. It’s a rustic, open-air restaurant where you can watch local life pass by as you eat. If your sensitive to the heat, be aware that there is no air conditioning, but then again, there really aren’t many restaurants with air conditioning in this part of the world. If that’s a concern for you, you might want to visit a different part of the country altogether. I don’t remember the name or number of the street Lidia’s place is on, but the town is small, so just ask anyone where it is. You can search “Lidia’s Place” in Waze to arrive conveniently. Lidia’s Place is open six days a week, from Tuesday-Sunday. That is to say that they are closed on Mondays. From Tuesday-Saturday, they open from 1:00 p.m. until 9:00 p.m. and then on Sundays, from 11:30 a.m. to 8:30 p.m. They also always close for the month of May, which is when they take their own annual vacations. Major credit cards are accepted. Menu prices include taxes. Alcoholic beverages are not available; vegetarian options are. When you visit, let them know The Tico Times sent you.